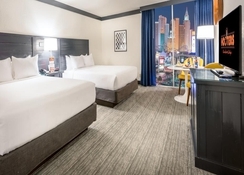 A hotel that is unlike one, Hooters Casino Hotel infuses new life to the Las Vegas Strip. Delightfully tacky yet unrefined, it features the famous Hooters decor, a Hooters-themed casino and a wide selection of alluring restaurants. 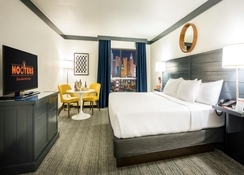 Sitting opposite the MGM Grand towards the Strip’s south end and only 6km from the Las Vegas Convention Centre, this heavily renovated hotel offers just under 700 air-conditioned guestrooms. 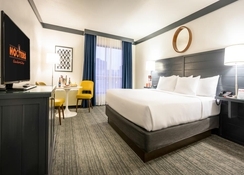 The Hooters Casino Hotel features two swimming pools, two spa tubs, a poolside snack bar and six restaurants and bars that feature the Hooters signature ambience. There’s also a state of the art gym which guests can use to maintain their fitness levels. 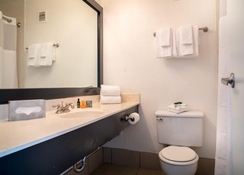 The establishment also offers 24-hour checkout, cloakroom, hairdresser, room service, laundry services and many more. 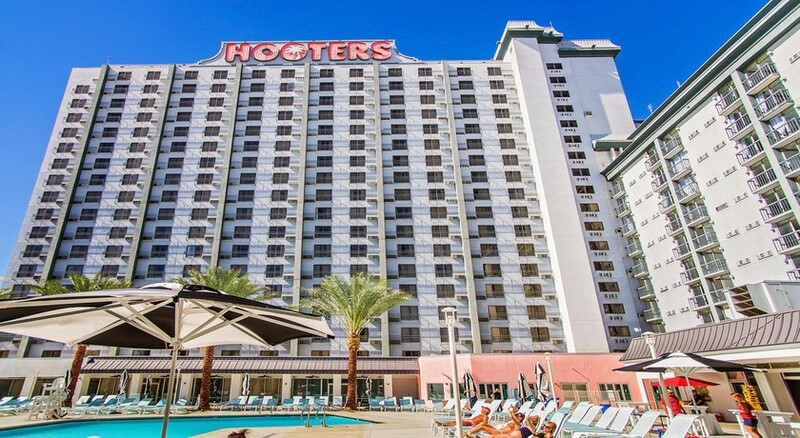 Located on the south end of the Las Vegas Strip and opposite the MGM Grand Hotel, Hooters Casino Hotel is barely 3.5km from the McCarran International Airport. The Ka theatre is about 800m, while the Cirque du Soleil is a kilometre from the hotel. The Monorail - MGM Grand Station is only 500m away. The hotel has a 19-storey main building with an impressive lobby and two bungalow buildings. 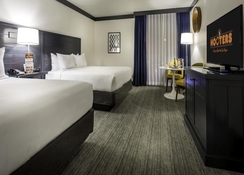 It offers as many as 696 well-appointed guestrooms and suites decorated in a tropical theme and furnished with modern amenities with excellent views of the Strip and the neighbourhood. The air-conditioned rooms come in various sizes and come with one king size or two double beds, satellite TVs, en-suite bathrooms, fine linen, safe, iron & board, high-speed Wi-Fi, en-suite bathrooms and hairdryer. Room service and laundry services are available at extra charges. The hotel mandates that at least one guest per room should be above 21. The hotel features five restaurants where guests can savour best of Las Vegas and international cuisine. 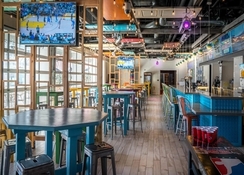 From the Hooters Restaurant that serves American Style boneless or smoked wings to delicious tacos, to steak n shake, to The Underground Lounge with karaoke bar, to The Porch – a poolside bar and the Southside Eatery a food court type snacks bar, the hotel covers it all! Hooters Casino Hotel has a lovely outdoor pool surrounded by outdoor furniture and sun umbrellas where guests can soak up the sun and relax. There is a shallow end for children and a pool bar serving lovely cocktails and mocktails. The casino with Hoooters Rewards program is a place to have fun trying your luck. There is a fitness centre for guests who wish to stay active and a gift shop and mini market to indulge shoppers.